So how does the game work is a good point to start. Imperial assault is a two player skirmish game. 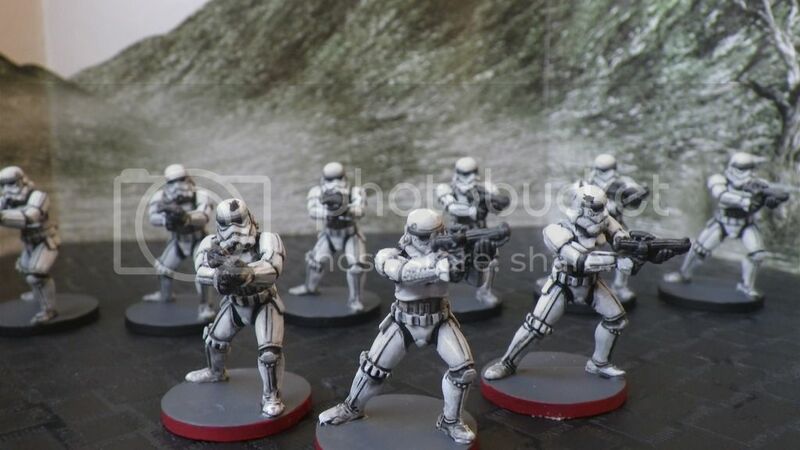 Strike teams (Army) is constructed by each player and are limited by points (40) and faction Imperial, Rebel and Mercenary. So Jay's Strike team 8 models and 5 deployments. This seemed a bit small to me but Vader is 18 of you 40 points and IMO well worth the points. The Mission we played was on the Massassi Ruins map. Leave no Evidence is the name of the mission and the deal is for both forces to remove crates from the board worth 6 points each and kill models of the opponent for more points - first player to 40 points win. So having more models in my force allowed me to remove 2 crates of evidence - makes me wonder what the rebels are trying to hide? this got me 12 points early in the game and because I've watched more games on YouTube than Jay I targeted the officers and kill them both. I'm not going to turn by turn description of the game but the highlights were Stormtrooper being annihilated by my wookie in one corridor and rebel troops and saboteur having an equally bad time with Vader. The last 2 acts of the game was Vader getting Luke 1 point of damage from death (talk about abusive dads - didn't he like the Light saber case he got for fathers day?) and I realising I might not win regardless of being the only player thinking about scenario (remember the crate of evidence). So I chase down the last surviving Stoormtrooper and gun him down for the win but it was close. The map and balance of points in scenario and combo of removing the crates of evidence but risking the damage from the communication beacon made this mission and map very interesting and challenging. Lessons I learnt from this game. Run away from Vader, Stun Vader, lead Vader away from the action. Speed and number of activation is important for scenarios and careful planning of order of activation is a big part of this game. The game balance is good IMO for example is a model like Vader good (Yes) but is he worth almost half your army? (Yes, I guess) and I really like how scenario generally helps you toward victory but engaging and killing you opponent models is a big part of the game too.